Kyle quizzes Rhan Hooper, HawksActive joins in the fun at a clinic on the 'G, the Bothwell Golf Club story is told. HAWTHORN has scored its sixth consecutive win in a highlight-packed encounter with Essendon at the MCG. The Hawks survived a second-half fightback from the Bombers to win by 16 points, 14.18 (102) to 13.8 (86). Star forward Lance Franklin turned in a classic performance, kicking five goals that included two contenders for goal of the year. But Franklin brought more than just finishing ability; his strength and speed around the ground was out of this world. Speaking after the game, coach Alastair Clarkson paid tribute to the Hawthorn superstar. “He was pretty special. Those goals from the boundary were unbelievable stuff. He played consistently well right throughout the course of the game,” Clarkson said. Sam Mitchell was the best midfielder for the Hawks, with his clearance work out of the middle never letting up. The Bombers rotated a raft of opponents on him but none could curb his influence. He had 28 touches and seven clearances. Andrew Welsh did a phenomenal job on Brownlow favourite Luke Hodge. The 2008 Norm Smith medallist played in the middle, the back half and spent the last quarter the forward pocket but he had little influence on the match. While acknowledging it was one of Hodge’s quieter games, Clarkson said he still made a solid contribution. “In terms of his structures and steadiness he still made a really solid contribution for us, Hodgey,” he said. Jobe Watson dominated Brad Sewell in the midfield while Chance Bateman and Brent Stanton were engaged in one of the more fiery duels of the evening with Bateman, who played a negating role, coming out on top. Jason Winderlich was the best Essendon player with 35 disposals. The Hawks were the better team in the first half but started to look weary in the third quarter and Essendon’s quick ball movement got them back in it. Cyril Rioli continued his rich vein of form with another highlight-filled display. His first mercurial moment was a one-handed contested mark in the first term but the effort that would have pleased coach Alastair Clarkson the most was the desperation he showed in laying three tackles in the space of 10 seconds during the third term. Rioli's pressure caused an Essendon turnover and it was moved quickly to Mitchell who just failed to convert. The third quarter was crucial to the outcome of the game and it went all Essendon’s way. Hawthorn had its chances but kicked poorly, ending up with 1.7 for the term. The last quarter was as good an exhibition of football as you could see. The Hawks were up by just one goal at three-quarter time and the first two majors of the final term, from Paddy Ryder and Franklin, were nothing short of sensational. With four of the first six goals of the quarter, the Bombers soon had the lead but it didn't last long as the Hawks - through Beau Muston, Jordan Lewis and Michael Osborne - finished the strongest. 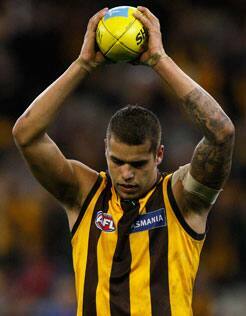 The Hawks may have come out winners, but no one at the ground could walk away disappointed with what they’d seen.